I have been whittling away at tagging the huge stack of photos in my Pictures folder. Photos with “None” in the “Keywords” category are down to 9776 (from over 10500). This going to take a little longer than I thought! -when I type in a new keyword that is a proper noun (capitalized), if it has the same initial letters as other key words in my database, it refuses to let me capitalize the new keyword unless I “left arrow” to retype the letter. KPhotoAlbum already has the ability to sort the keyword/places/people lists. Using this button will sort the keywords according to which were most recently typed, which also is very handy. a) make the sorting preference of one supercategory (e.g. people) independent of the sorting preference for the other supercategories. What I mean is, I would like to keep “places” sorted in the hierarchical tree pictured above, while keeping the people and keywords sorted with the most recent ones at the top. b) The “sort by most recently typed” option would be even handier if it was “sort by most recently typed or selected with the checkbox.” In other words, either typing a new keyword or selecting an existing one should put them at the top. c) in my “places” supercategory, it would save a LOT of clicks and mouse wheel scrolling if selecting “Hicks Cemetery” (using the illustration above) automatically caused Watson Township, Allegan County, Lower Peninsula, Michigan, and USA to also be selected. I wish I was a programmer, and could offer code instead of just comments. Perhaps these things are already underway. I do know that Jesper Pedersen and crew are actively working toward the KDE 4 version. When new functionality begins to leave KPhotoAlbum 3.x.x behind, it may push me to take the plunge back into KDE 4. Until then, I’m enjoying a bit of productivity. We’ll see what KDE 4.2 brings in a few months. I have a couple of nights off from work, so tonight I am biting the bullet and starting the monumental task of tagging my digital image collection. As I explained in previous posts, I will be using KPhotoAlbum, which is very likely the most efficient tool for photo tagging in existence. However, it is still work!. As you can see, there are several “super categories” listed on the left. Clicking on “Places” allows me to see all the sub categories. Clicking on a subcategory will select all pictures with that tag, and display how many are in the current selection in the “Show Thumbnails” line. Clicking “Show Thumbnails” at any point will give you a display of all the pictures in your current selection.This is how you can quickly drill down to exactly the pictures you are looking for. KDE4. I look forward to seeing the new version. Overload: the biggest problem with digital photography! 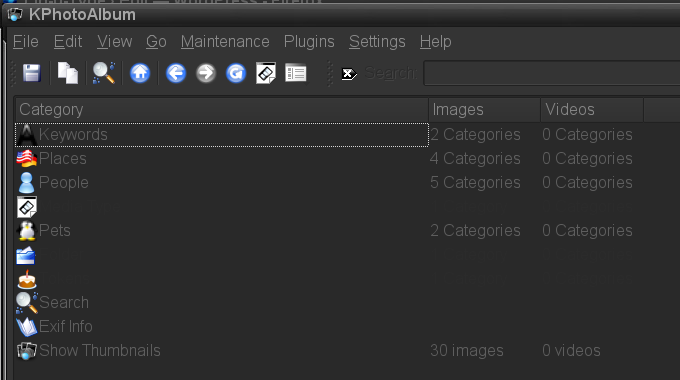 Over 9000 images in main folder… about 3000 to go… time for bed. My brain is mush, and so is my mouse clicking finger. Update 2: Just the process of consolidating my pix into one folder trimmed the size down from over 12,000 to 11,000! That means that there were over 1000 duplicates scattered around. For example, a certain picture of myself may have had one copy in the “Family” folder, another copy in the “Portraits” folder, another copy in the “Trip to Illinois” folder, etc. I expect further processing to eliminate even more. Update 3: I came to realize that computers don’t really like thousands of files in one folder. Therefore I compromised by creating one folder per year. This gets it down to no more than around 5000 in any one folder, which reduces the load on whatever mechanism the computer has for creating thumbnails, etc. Our family has gone through some major transitions during recent years. We have moved from Grand Rapids, Michigan to Flint, Michigan, to Florida; from a comfortable home to 2 years in a hotel, to our present mobile home in Florida. Much of that “progress” has been documented with our Nikon Coolpix 5700, and a few other digital cameras. In fact, in the 6 years or so that I have been taking digital photos, I have amassed over 12,000 pictures on my hard drive. Photos are by far the largest portion of my file space. I have my KDE screen saver set to slide show mode so that it keeps throwing random images up every 20 seconds. (You can do that when you “keep your nose clean!”) It has been fun to have that constant visual reminder of people and places we love. Often we’ll interrupt whatever we’re doing to comment on some random picture… “Who on earth is that? ?” “Oh, that’s the janitor at the school where Mary Ann taught…”, etc. The worst part of having a huge digital collection, as you might guess, is getting it organized for easy access, and keeping it that way. My practice has been to create folders that are named according to content. That was great when there were twenty or thirty folders. But now that there are almost 400 (and in some places several levels of subfolders), there is just no way to quickly find what I’m looking for. What looked to me like a promising “scheme” of file and folder structure at the start, has become very cumbersome and problematic when multiplied to exponential proportions. Enter KPhotoAlbum, which has been designed by Jesper Pedersen to address this exact problem. His solution? Tagging, rather than “foldering.” With KPhotoAlbum’s tagging, you can find almost any picture (that you have tagged) in a matter of seconds. See Jesper’s video demos here. It really works! It really does make the tagging of photo content an efficient process. It’s still work, mind you, but it is efficient work. I have been using KPhotoAlbum somewhat hit and miss for several years, and I’m quite sure that it is the solution to my photo problem. The only thing keeping me from making it my only solution is the prospect of tagging thousands of pictures. Here is my plan: I’m going to kick the legs out from under the table. I’m going to burn the bridges behind me. I’m going to motivate myself to get busy tagging by eliminating the folder structure entirely! I’m going to put ALL the pictures in one folder, so that almost the only way to find anything is to get it tagged! I suspect this will motivate me to get rid of a lot of blurry, unnecessary pictures as well!